The film rights have been sold to Scott Free, the London office of Ridley Scott. During the years 1858-1947 India was ruled by Greet Britain, a period known as the Raj. During this time, many young women set out for India where, if all went according to plan, they married. They were known as the Fishing Fleet. This book was published on 12 July 2012 and jumped straight to no 1 in Amazon’s Mover and Shakers, to no 4 in the (non-fiction) best-sellers list, no 2 in the Telegraph Books list and no 1 in the Evening Standard best-sellers list, no 1 in the Evening Standard best-sellers list, the DD ‘and was seven weeks on the Sunday Times best-sellers list’. The paperback, which came out in October 2013, went immediately into The Sunday Times and Daily Telegraph best-seller lists. It has never been told before; and I am fortunate enough to have been allowed to use almost thirty hitherto unseen collections of letters, diaries, journals and memoirs, lent to me by the children or descendants of these girls. In Victorian times, the plight of the gently-born spinster – say, the sixth daughter of a poor vicar – was wretched, with no money of her own, no independence and no means of earning a living except as a governess. Small wonder that with the opening of the Suez Canal in 1868, women flooded through, heading for a country where men outnumbered women by roughly four to one. These girls, who travelled in the autumn to catch the cold weather, were known as the Fishing Fleet. By the late 1800s and during the twentieth century, they could be roughly divided into three groups. Some were the daughters of families who had lived and worked in India for generations, sent home to be educated, then brought back by their mothers or a suitable chaperone to join their families. others had been invited out by, say, a sister or cousin married to an I.C.S. 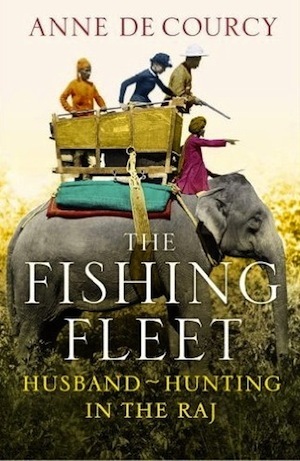 man or British officer, a third group had been despatched by their families with the words: ‘Go to India and find yourself a husband!’ ringing in their ears. One thing they could be sure of was a rollicking good time, with dances, amateur theatricals, picnics, paper-chases, horse shows, cinemas, gymkhanas and sometimes a visit to the almost medieval glamour of a princely state, with its white marble palaces, dazzling in the sunshine, domes, arches, pillars and minarets reflected in the water, palm trees, half-hidden palace gardens, storks, cranes, peacocks, and perhaps a tiger shoot thrown in. In those jasmine-scented nights, under brilliant stars, surrounded by young men fit from tennis and polo, it was almost impossible not to fall in love – as many of the diaries make clear. But once married, a Fishing Fleet girl’s life might change dramatically. During most of the Raj, there was no air conditioning, Factor 40 sun cream, main drains, air travel, antibiotics or – up country – amenities like refrigeration, radio or telephone; malaria was endemic, there were outbreaks of plague, cholera – sometimes so bad that monkeys fell dying off the trees – jungle fever, enteric fever, plague, Delhi boils and prickly heat. What was truly amazing was the way these girls, most only in their early twenties, managed to cope with more or less everything life in India threw at them. Drawing extensively on firsthand accounts, Anne de Courcy's sparkling book is an unalloyed delight.